I’m sure most of us don’t like pills. Ain’t I right? Well, the main reason behind this is mainly because they are bitter. But there’s a small exception, if they are sweet, then we like them. This reminds me of those chewable vitamin tablets which I used to eat when I was small, mmhhh…they were tasty. 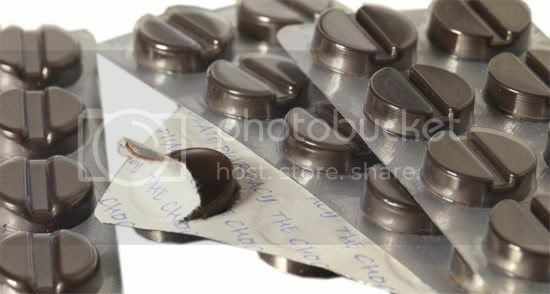 Ok so let me show you similar pills, they aren’t vitamin pills but they are Chocolaty pills! 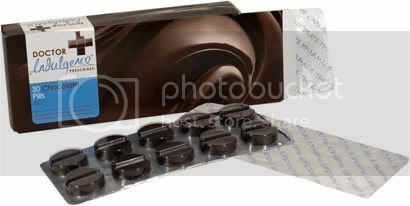 These are the only pills that will make your mouth salivate once you see them. Attack of the monthly shezillas. Brad Pitt will never be my boyfriend awakening. I’ve overdosed on sad girly flicks. I’ve lost my favourite lip gloss. That damn woman from work I hate is wearing the same top as me. I DON’T KNOW WHY BUT I’M ANGRY disorder. I’m running late and my heel has just snapped. It’s raining on my hair that I’ve just spent an hour perfecting. Oh No! My ex just saw me in a dirty oversized rugby shirt with bed hair. These certainly sound crazy. But looks like the Chocolaty doctor didn’t have any intentions to cure guys. Anyways if you liked this, you can get 30 pills for $5 from here.